High Lead Levels In Michigan Kids After City Switches Water Source Flint, Mich., started drawing its tap water from a local river in April 2014. The water is so corrosive that it's causing lead to leach out of aging pipes, resulting in serious health issues. 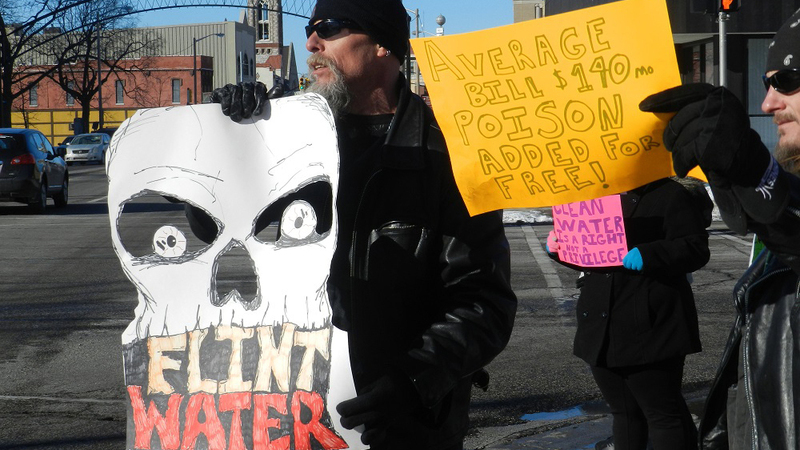 Residents of Flint, Mich. (shown here in January), have been protesting the quality and cost of the city's tap water for more than a year. Doctors are finding elevated levels of lead in the children in Flint, Mich., and local tap water is the likely cause. That's the latest alarming news to come out of the city, which switched its water source about a year and a half ago. A pediatrician with Hurley Medical Center analyzed lead levels of hundreds of children. She compared blood tests before and after April 2014. That's when Flint, unable to come to an agreement on a short-term contract with Detroit, quit buying water from its system and signed on with a new system that will draw water from Lake Huron. But that system won't be online until next year. So in the interim, with assurances from the state that it would be safe, the city decided to pump water from the Flint River. Dr. Mona Hanna-Attisha's research found that the percentage of Flint children 5 years and younger with elevated lead levels nearly doubled after the switch, from 2.1 percent to 4 percent. "My research shows that lead levels have gone up," Hanna-Attisha says. "I cannot say it's from the water. But that's, you know, the thing that has happened." The news did not surprise Lee Anne Walters, who suspected the water had something to do with health problems in her 4-year-old son, Gavin. "I kept talking to the doctors, trying to figure out why he wasn't growing," she says. "He was 27 pounds at 4 years old. His hair was thinning, breaking out in rashes." Complaints about foul-smelling, discolored water began soon after the city started drawing water from the Flint River. In the summer of 2014, the city issued a notice for residents to boil their water because of E. coli contamination. And I got a frantic phone call from the water department telling me to please make sure my kids didn't drink the water, don't mix their juice with it, because they had never seen a number that high for lead. Then the city was found to be in violation of the Safe Drinking Water Act because of high levels of a disinfectant byproduct called total trihalomethanes — an unintended consequence from all the chlorine the city had to use to kill the E. coli. Walters says her whole family broke out in rashes, and they stopped drinking the water in December. Then, in February of this year, the city tested her water for lead. "And I got a frantic phone call from the water department telling me to please make sure my kids didn't drink the water, don't mix their juice with it, because they had never seen a number that high for lead," she says. After that, Walters decided to take Gavin in to be tested for lead. He'd been tested before the city switched its water source. At that time, he had a level of 2 micrograms of lead per deciliter of blood. After the switch, his level was 6.5. The Centers for Disease Control and Prevention says a level of 5 is considered "much higher" than that found in most children. It also says there is no safe level of lead exposure — and the effects, like lower IQ, are irreversible. The day after Hanna-Attisha released her findings, the city put out a lead advisory, urging people to flush their pipes, install inexpensive filters, and use cold water for mixing baby formula. "As a father, I want every family and household in the city of Flint to be safe and secure," Mayor Dayne Walling said at a press conference to announce the advisory. Over the summer, researchers from Virginia Tech found that Flint River water is highly corrosive. That means when it comes into contact with lead from service lines, household pipes or solder, it eats away at the lead and sends it right to people's faucets. City officials and state regulators say they're now putting together a corrosion control plan to reduce lead exposure. "Flint is the only city in America that I'm aware of that does not have a corrosion control plan," said Virginia Tech's Marc Edwards, who led the research. Edwards also uncovered lead contamination in Washington, D.C. He says Flint's lead levels are not as high, and the exposure period is not as long as it was in that city. But he has some harsh criticism of city and state officials for how they've handled the Flint situation. "It was clearly a failure of government agencies to do their job to protect the public," says Edwards, citing the absence of a corrosion control plan from the outset. A draft report from the EPA that was obtained by the ACLU of Michigan also takes the city and state to task. "Prior to April 30, 2014, the City of Flint purchased finished water from the City of Detroit which contained orthophosphate, a treatment chemical used to control lead and copper levels in the drinking water," the report read, adding that the treatment was discontinued after the switch to Flint River water. "In accordance with the Lead and Copper Rule (LCR), all large systems ... are required to install and maintain corrosion control treatment for lead and copper. In the absence of any corrosion control treatment, lead levels in drinking water can be expected to increase," the report continued. But officials with the Michigan Department of Environmental Quality dispute the findings of the draft report. MDEQ spokesman Brad Wurfel says the report was the work of a "rogue employee" and promised the final report — not yet released — would tell a much different story. "You have to have to do a full year of studying" the water chemistry as it behaves across the system before implementing corrosion control, Wurfel says, adding that's the only way to know how much phosphate to add to the water. An announcement about the corrosion control plan is expected soon. Meanwhile, city officials are showing increasing interest in returning to Detroit's water system — something that even a few days ago they dismissed as economically unfeasible for the cash-strapped city. Whatever the solution, residents like Walters say they hope the city can reach one soon. "I want them to take responsibility," Walters says. "I want them to quit poisoning their citizens."